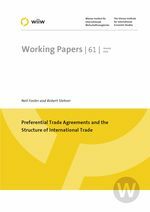 In this paper we examine the impact of membership in Preferential Trade Agreements (PTAs) on trade between PTA members. Rather than considering the impact of PTA membership on the volume of trade we consider the impact of membership on the structure of trade. For a large sample of countries over the period 1962-2000 we find that membership in a PTA is associated with an increase in the extent of intra-industry trade. In addition, we find that the effect of PTA membership on IIT is larger when a PTA is formed between two developed countries.